desktop with automatic desktop organization. Organize the desktop by creating moveable and shaded areas that contain groups of icons. Double-click any empty part of the desktop and the fences will disappear or reappear. 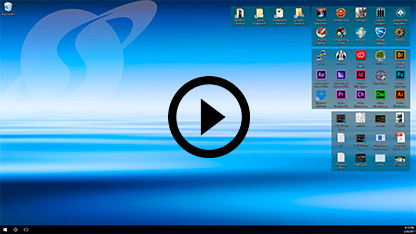 Create a fence from any folder or network on the PC and its contents will be displayed as a fence on the desktop. View the contents of these fences as icons, lists, or details. Extend the desktop with pages of fences that can be accessed by clicking and swiping the mouse. Rules-driven organization automatically places new icons into designated fences and sorts it within the icons that are already there. Users can organize icons based on file type, file name, and more. Users can control the size, location, and contents of each fence to include dynamic sorting. For example, this enables frequently used files to automatically migrate to the top of a Fence for easy access. Web-based or local license management eliminates the need for individual keys with each deployment. Admins can configure Fences to standardize layouts and icons for your company's deployments with only a few simple steps. Fences maximizes available desktop space by enabling you to hide your fenced icon groups until they are needed. Simply tap the screen to create or modify fences, hide and display fenced icons, or scroll within fenced areas. Deploy Fences using a customizable batch file to install and activate with limited infrastructure interaction.